I think people who do not follow the international track scene or who’ve run track at one time in their life, can not fully appreciate what Usain Bolt did the other night. To me, him breaking the 200 meter world record was far more impressive than his world record in the 100 meters. Up until 1996, the world record for the 200 meters stood for 17 years. For a track record, that’s along time. Then in the 1996 Summer Olympics in Atlanta, Michael Johnson put on one of the most impressive displays of sprinting that anyone has ever seen. He shattered the world record by four tenths of a second. In track, that just doesn’t happen. Four tenths of a second is an eternity for these world class sprinters. I remember that night in Atlanta, watching Johnson destroy the rest of the field in his gold spikes. When the clock read 19.32, no one could believe it. People thought this was a record that would stand for fifty years. The closest anyone had come it was Tyson Gay in 2007 when he ran a 19.62, still three tenths of a second way. Then comes Usain Bolt. Twenty two years old. Six foot, five inches. I think Micheal Johnson started to worry about his record after watching Bolt coast to a record in the 100 meters. Johnson predicted a 19.5 from Bolt. So what does Bolt do? He goes out and does something no one has ever done at an Olympics: win the 100 meter and 200 meter finals and establish world records in both. 9.69 and 19.30. The silver medalist in the 200 meters was half a second back!! Amazing. 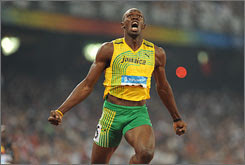 There’s now talk about Bolt going after the 400 meter world record, something I know everyone would just love to see. Congratulations Usain.